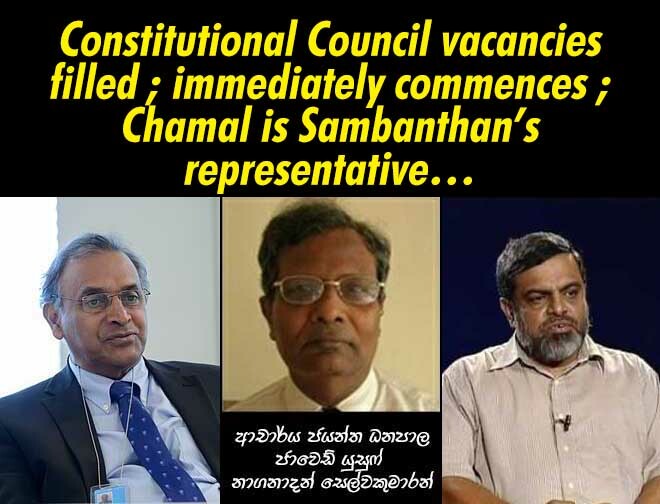 (Lanka e News -13.Oct.2018, 6.45 AM) The Parliament gave the approval on the 11 th to fill the vacancies in the Constitutional Council , and the names of those members to be appointed were : Dr.Jayantha Dhanapala, Javed Yooosuf (lawyer) and Naganathan Selvakumaran (lecturer) . The ten members of the constitutional council have now been appointed. The prime minister , speaker and opposition leader are officially appointed as members of the Council . Already Mahinda Samarasinghe has been appointed as president’s representative . Chamal Rajapakse M.P. was appointed as representative of opposition leader and Talatha Atukorale was appointed this time as prime minister’s representative. JVP M.P. Bimal Ratnayake was appointed as representative of minority parties. According to the 19 th amendment to the constitution the official term of the constitutional council is 03 years. The second Constitutional Council appointed under good governance government was scheduled to commence sittings on the 12 th ,as Priyasad Dep Chief justice is due to retire on the 13 th , another member must be appointed in his place. The most senior of the judges after Dep is Eva Wanasundara. However she can old the CJ post only for a short period of three months (retirement age) , and owing to her partiality she is unlikely to be appointed. Based on unofficial reports, the next in line is Nalin Perera and it is his name that is proposed.